Very often outbuildings happen as an afterthought and people go off and buy various kinds of prefabricated sheds, garages or summer houses. Usually these buildings are the worst possible in terms of green design because they tend to have travelled a long way and be made of materials which are high in embodied energythe total amount of energy it takes to make a material (or a building). See more on embodied energy and contain harmful chemicals such as dangerous wood preservatives. If this is the case they will also probably look like afterthoughts and seem out of place. In fact outbuildings are probably the best place to use recycled materials which you may come across while doing other building work. Recycled timber which may not be quite good enough to use in the house may be fine for an outbuilding. 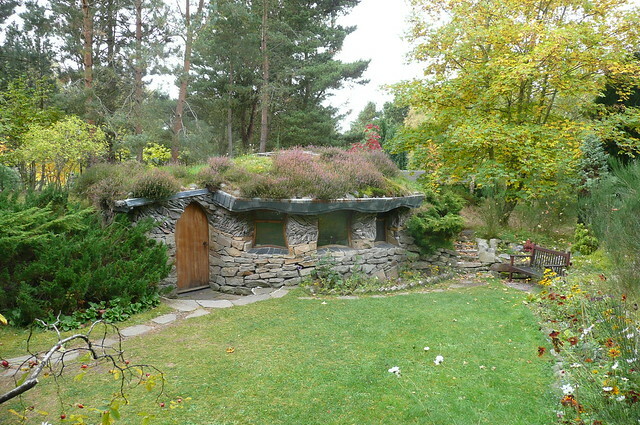 Straw bale walls may be a good choice for an outbuilding which needs insulation. Second hand doors and windows may be appropriate. If you are doing major building work you will probably have various materials left over which were used for temporary purposes such as security shuttering, temporary services, temporary flooring etc. With a bit of forethought these can be incorporated into outbuildings. It may also be that you needed storage for materials during building work and this can later be turned into outbuildings. There is some Sketchup3D modeling software 3D modelling software for designing small (up to 30m² floor area) garden sheds, tiny houses etc. using the Segalrefers to a simple self build timber frame form of construction pioneered by the architect Walter Segal. see details of the system self build method. The regulations regarding outbuildings such as garden sheds are often contained in local council bye-laws rather than being part of the national Building RegulationsThese are the mass of regulations that cover safety, health, welfare, convenience, energy efficiency etc. in the way buildings are constructed. Not to be confused with Planning consent (which is more to do with whether you can put up the building in the first place). See more on the regulations or planning consentthe legal basis for being allowed to do some form of development such as building a house. (not to be confused with Building Regulations which are all about whether the building is properly constructed). see more on Planning so it is worth checking these out early in the design process.